Melbourne: Steve Smith on Tuesday capped a remarkable season by sweeping the main awards at the annual Allan Border Medal ceremony, including Australian player of the year. The prolific batsman, who was promoted to national captain in the absence of the injured Michael Clarke, also took out the one-day and Test player awards. He was a runaway winner for the Allan Border Medal- judged on performances in Tests and one-dayers throughout the season- by polling 243 votes, ahead of David Warner (175) and Mitchell Johnson (126). Cricket Australian, the official governing body took to microblogging site Twitter to congratulate the young rising star. 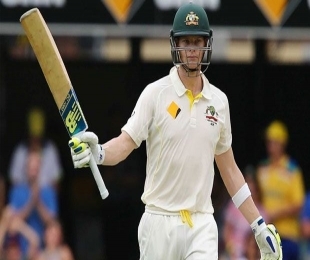 Smith now is only the third player to win the trifecta in the 10 years it has been running, following in the footsteps of Ricky Ponting in 2007 and Shane Watson in 2011. Other Allan Border Medal winners include Glenn McGrath, Steve Waugh, Adam Gilchrist, and Clarke. The 25-year-old smashed 1,756 runs in 22 matches last year at an average of 67.54 including eight 50s and seven hundreds. He narrowly held off Warner as Test player of the year and Aaron Finch for the one-day honour. Glenn Maxwell was rewarded for his efforts with bat and ball to win Twenty20 player of the year. The emotional high-point of the night came when Sean Abbott was named the Bradman Young Cricketer of the Year. The New South Wales all-rounder has shown courage and maturity to bounce back from the tragic death of Phillip Hughes during a Sheffield Shield match in November. Abbott bowled the ball that killed Hughes and there were initially fears that the 22-year-old may be too traumatised to continue his career. But he quickly returned to play a key role for his state team and also performed well for the Sixers' in the domestic Big Bash Twenty20 competition.